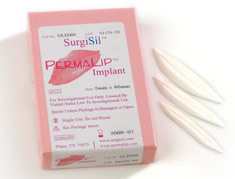 Permalip™, launched in the UK in 2007, is manufactured by US based company Surgisil and distributed in the UK by Surgisol Ltd. It is a silicone implant designed exclusively for lip enhancement. Permalip™ is made of very soft, solid silicone which is tapered at each end to match the natural shape of the lips. The implants cannot leak or rupture, and come in a variety of sizes (9 in total) depending on the amount of lip augmentation required. The procedure takes approximately 15 minutes and is performed under local anaesthetic. The implants are inserted via two small, 4mm incisions at the corner of the mouth on the upper and low lips. The implant is then passed through a tunnel created in the lip and centred; the incisions are then stitched closed with absorbable sutures. Although Permalip™ is designed to be a permanent lip enhancement the manufacturers claim that it can be easily reversed by implant removal, due to the smooth surface of the implant. This surface, which consists of a proprietary coating to avoid the silicone coming in direct contact with the body, stops tissue in-growth into the implant and reduces the development of excess scar tissue. Permalip™ received European CE Mark approval in June 2006 and is FDA approved. Fully trained and qualified surgeons or doctors only. Inserting lip implants should be avoided in areas where the skin is swollen or where infections are currently present, e.g., active acne or cold sores, until these have been successfully treated. This will reduce the post-operative risk of further infection after the insertion of the implants. Those people who have problems with healing and/or scarring may also be unsuitable for a Permalip™ procedure. Patients should expect their lips to swell post-operatively quite disproportionately to the minimally invasive nature of the procedure, with swelling lasting for 3 – 4 days and bruising for 7 – 8 days. Lips will still be sensitive to pressure for about 2 weeks. This may cause difficulties with speaking, smiling, eating and drinking for a short time. Potential risks include scarring (at the insertion points), which should fade over time, and infection. Post-operative advice includes the taking of anti-biotic and anti-viral medication to avoid any potential infection and foreign body reactions. For a gallery of Permalip™ before and after photographs, please visit the Surgisil website. Costs for Permalip™ treatment can range from approximately £2,000 - £3,000. Click for ALL Permalip ™ clinics in the UK & Ireland registered and verified by Consulting Room.